Calvary Chapel Windsor was founded by Scott and Nancy Cox during the summer of 2006, starting with a small group Bible study on the book of Acts in their home. Sunday morning services began in October at Windsor High School cafeteria going through the book of Genesis with about 20 people. God was faithful, and the church slowly grew. In January of 2011, we started airing a radio show on 89.7 GraceFM. In May of that year, we moved to Windsor Community Playhouse for church services, renting a neighboring unit for the high school youth group, children’s ministries and Bible studies. Scott worked outside of the church for the first several years but left secular work with the City of Greeley in 2015 to go full-time with the church. In late 2017, True North church leaders approached Pastor Scott about merging the two congregations. True North needed leadership, and Calvary needed a building. 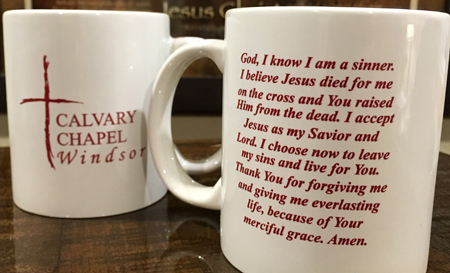 It turned out to be a great fit, and the churches merged under the name Calvary Chapel Windsor in March 2018. True North Church was founded as Church on the Ancient Path in 2003. Many people were saved and deepened their walk with the Lord through that ministry. The church flourished during the first 13 years and changed its name to True North in 2016. Sadly, the church went through a split, and the pastor resigned in the summer of 2017. We are honored and excited to be joined together as one congregation. We have a very down-to-earth style here at Calvary with modern worship, casual attire, and conversational sermons. The Bible is taught in an expository manner, with a strong emphasis on applying God’s truth to our everyday lives. We share the gospel message every Sunday morning, and visitors tell us they always feel welcomed. Our desire is to introduce people from all walks of life to Jesus, and help them grow strong in their walk with Him. • Youth group helps kids get serious about the Lord while also developing friendships and fellowship. • Missions trips are offered on a regular basis. • Worship band leads both hymns and modern worship music. • Children’s ministry is loving and Biblical. • Prayer ministry is active and integral to all we do. • Biblical counseling is offered free of charge. • Benevolence is given to those in need, as the Lord directs. God is doing amazing things at Calvary. Come see if this is where He wants you to be at home. We believe the only true basis of Christian fellowship is Christ’s Agape love, which is greater than any differences we possess (Phil. 2:1-2) and without which we have no right to claim ourselves Christians ( 1 John 3:10-16). We believe worship of God should be intelligent. Therefore, our services are designed with great emphasis upon the teaching of the Word of God that He might instruct us on how He should be worshipped (2 Tim. 3:16-17; 4:1-2). We believe worship of God should be fruitful. Therefore, we look for His love in our lives as the supreme manifestation that we have been truly worshipping Him (Luke 6:43-44; John 13:35). After Jesus ascended to Heaven (Acts1:9), He poured out His Holy Spirit on believers in Jerusalem (Acts 2:1-4), enabling them to fulfill His command to preach the Gospel to the entire world; an obligation shared by all believers today (Matt 28:19-20). We believe that all people are by nature separated from God and responsible for their own sin (Rom. 3:23; Is. 59:2), but that salvation, redemption, and forgiveness are freely offered to all by the grace of our Lord Jesus Christ (Rom. 6:23). When a person repents (Acts 3:19) and accepts Jesus Christ as personal Lord and Savior (Rom. 10:9-11), trusting Him to save, that person is immediately born again and sealed by the Holy Spirit (Acts 17:31; 1 Cor. 15:3-8), all of his/her sins are forgiven (1 John 1:9), and that person becomes a child of God, destined to spend eternity with the Lord. We believe in the gifts of the Holy Spirit mentioned in the Scriptures (1 Cor. 12:1-11), and that they are valid for today and are to be exercised within scriptural guidelines. We, as believers, are to covet the best gifts (1 Cor. 12:27-31), seeking to exercise them in love that the whole Body of Christ might be edified (1 Cor. 14:12). We believe that love is more important than the most spectacular gifts, and without love, all exercise of spiritual gifts is worthless (1 Cor. 13).